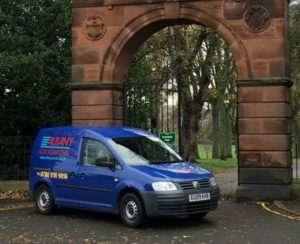 Albany Locksmiths Edinburgh offer a range of locksmith services from emergency call-outs to free, no-obligation security evaluations. Please use our dedicated mobile number 07809 569 856 if you need an emergency locksmith or our contact form for all other enquiries. We have more than a decade's Locksmith experience working in the security industry making one of us the most trusted Edinburgh locksmiths around. We offer compeditive LOW FIXED PRICING, NO CALLOUT CHARGE and NO ADDED VAT. As we a Locksmith Edinburgh truly based in the city, in 95% of emergency cases we can get to your door in under 30 minutes. For your peace of mind our fully-qualified locksmiths are insured for up to £2,000,000 and CRB checked. All our new parts are covered by a one year guarantee and unlike larger companies we do not add VAT to the end price. We provide emergency locksmith services for Edinburgh, East Lothian, West Lothian, Fife and the Borders. In fact you may have seen one of our vans out and about and, because we are independent, when you call you will speak directly with an Edinburgh-based locksmith who, through hands-on experience, will know how to best diagnose the problem, offer a solution and give you an idea of the cost. Please read our free advice on how to keep your property safe and secure, we supply a vast range of lock products ie: Yale locks or night latches, mortice locks, multipoint locks for UPVC doors and HMO locks preferred by Edinburgh local authorities. Contact us or speak with a Locksmith direct.